Well, hello.And welcome to this Planet.We call it Earth.Our world can be a bewildering place, especially if you've only just got here. Your head will be filled with questions, so let's explore what makes our planet and how we live on it. From land and sky, to people and time, these notes can be your guide and start you on your journey. And you'll figure lots of things out for yourself. Just remember to leave notes for everyone else… Some things about our planet are pretty complicated, but things can be simple, too: you've just got to be kind.Here We Are is the utterly heartfelt new book from Oliver Jeffers. We're glad you found it. So here's one from last year, that I am sure everybody knows about...but I love it so much I thought I would write this post anyway, because I want to make sure everyone knows about this book. I have no words for this book really, I simply loved it. It feels like Oliver Jeffers has let us into his lounge room where he is talking to his new son about the world...and that's pretty much what it is. 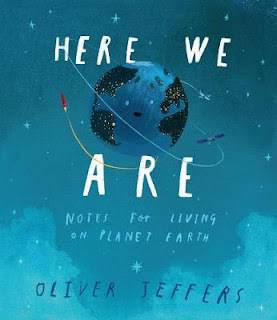 Oliver Jeffers wrote this for his son, and we are so fortunate that he turned it into a book and shared it with the world because it is beautiful. I have already given it as a Christening gift, it's must for new parents, and I think it could (should) be a valuable resource in the classroom too. "There are only three words you need to live by, son: respect, consideration and tolerance'" - Truer words have never been spoken.